What is your favorite staple ingredient? You will know this is great stuff the moment you break open the seal on the bottle. Remove the lid and savor the deep and complex aroma wafting from the bottle! 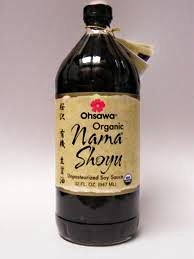 Opening a new bottle of Nama® Shoyu is one of my favorite pleasure moments in the kitchen! It is like opening a bottle of fine wine. There are many brands of naturally-brewed soy sauce available in most health food stores but I find none of them come anywhere close to the deep, rich flavors and aroma of Nama® Shoyu. This is hands down the absolute best! With other soy sauces, I find you cannot get all the flavor without using too much of the soy sauce and that makes the food too salty. Not so with Nama® Shoyu—just add a little and you get all the great flavor and your food will not be too salty. 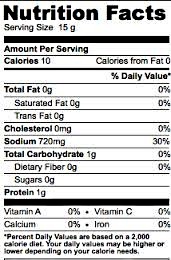 Nama® Shoyu is higher-priced than other brands but you will use less of it and get much greater flavor and health benefits. If you do not see Nama® Shoyu in your natural foods store, you can order it from Gold Mine, the exclusive importer of Ohsawa® products. This entry was posted in Cooking, Ingredients, Product Review and tagged Condiments, Condiments and Seasonings, Nama Shoyu, Ohsawa brand foods, soy sauce by mycookinglifebypatty. Bookmark the permalink.